Denver – September 7, 2017 – Buyers Access (BA), the country’s largest provider of customized purchasing solutions, and BluTrend a national premier utility management provider, today announced a unique partnership to offer BluTrend’s proprietary utility invoice processing and payment solutions, and other related energy management programs. “We are pleased to add BluTrend as a supplier partner, and to offer additional services that are in high demand to our members,” said Dan Haefner, President and CEO of Buyers Access. “We are constantly searching for new ways to increase value for our members. BluTrend’s services offer our members the opportunity to improve timeliness and cost of utility invoice processing, to generate significant personnel time savings and to create additional ancillary income, all while improving utility management data visibility – a win on multiple fronts”. “Buyers Access decision underscores the value proposition embedded in utilizing the most advanced technologies and automation in our space resulting in more efficient processes, which generate higher NOI and enhanced accuracy,” said Marvin Banks, Chairman of BluTrend. “BluTrend’s patented CSASecure, unique Automated Invoice Processing (AIP), full integration with Yardi and OneSite, comprehensive resident statement and convergent billing, and widespread experience in both regulated and deregulated utility markets is extremely beneficial to property management companies. We believe through the application of technology solutions, owners and management companies can enhance NOI and generate additional return potential not readily present in the space, “said Jim Kjolhede, a Partner of BluTrend. As a residential property manager, you’re likely already gearing up for the 2018 budget season. As busy as property managers are with the many hats they wear — marketing and sales, screening prospective residents, assisting with all manner of residents requests, and more — most understand that putting together a solid budget is critical for financial performance all year long. A budget tells you where you are and where you’re going, and it helps you measure your progress along the way. It provides an organized and easily understood look at money coming in and going out for anyone who might need the information, including your staff, community investors, and financial professionals. It’s also an invaluable tool for you in assessing how your community is performing, identifying any fat to be trimmed, and adapting as situations change. As you prepare your 2018 budget, take a look at the tips below to help make the process as painless as possible. Visit the library, use an online database, or search online to review standard income, expenditures, profit margins, and other metrics for your industry. You can find lots of free information simply by searching online for various keywords, and you can also find annual reports from market research firms that give away some information for free and include others for a fee. If your community isn’t at full occupancy, create a marketing, sales, and communications plan before working on your budget. Does your website need work? Should you be focusing more on generating and cultivating leads? If marketing isn’t your primary area of expertise, consider working with a local marketing firm or a national company specializing in property management for ideas. Put together your marketing plan first so you can include funding in the budget to cover any new or existing initiatives. Also, spend time thinking about whether your pricing is on target. Are rents where they should be based on market averages, demand, and supply? Should you consider additional fees for services such as using the fitness center? What can be trimmed from last year’s budget? Are you overstaffed for your current occupancy? Are there areas in which you know you’re spending too much? Spend time reviewing budgets from the past several years and considering your unique situation to determine if any areas can be cut. Prior to working on the budget, sit down with your tax professional for an update on any changes in the local, state, and federal tax codes that may affect you. Plan accordingly for any additional expenses that may result. Sit down with your maintenance staff — and maybe even a hand-picked panel of residents — to plan for needed capital expenditures. There will always be something that can be fixed or upgraded, so you’ll need to prioritize. What has to be done in 2016 and what can be put off for future years’ budgets? Consider your community’s overall financial situation, but also consider the marketing impact and curb appeal of certain upgrades over others. No property manager looks forward to creating a budget. However, most also understand that taking time to put together an effective budget is critical to the ongoing financial and operational performance of a community. Spending some time planning by reviewing industry information, thinking about how to increase revenue, reviewing spending and taxes, and negotiating with vendors can help make the task a little less daunting. 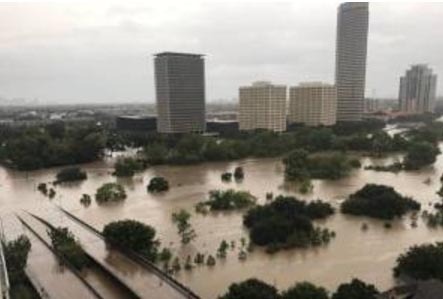 According to data provider CoreLogic, 52% of the residential and commercial properties in Houston that are at high or moderate risk of flooding from Hurricane Harvey are not in federally designated flood zones. This could mean that many of the homes and businesses that have been damaged in the hurricane are not insured for flooding. The Wall Street Journal’s Nicole Friedman notes that many property owners outside these flood zones aren’t required to buy flood protection and often forgo it. Most residential flood insurance is provided by the federal government’s National Flood Insurance Program, which also insures some businesses. Federal flood maps are generally used to determine which property owners need to buy flood insurance. Homeowners in flood zones, for example, are required to maintain the coverage by their mortgage companies. 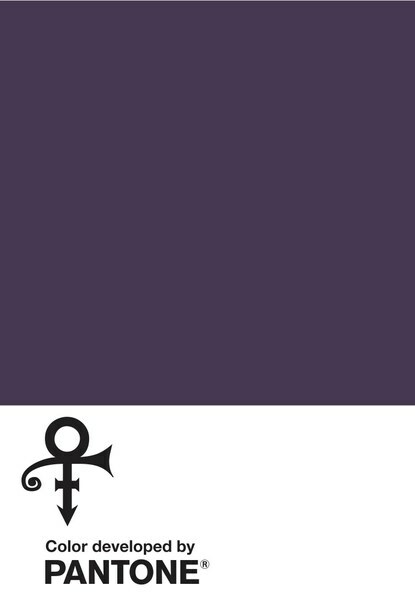 The Pantone Color Institute announced that they have created a special hue in honor of the late artist. Courtesy of Pantone Color Institute. 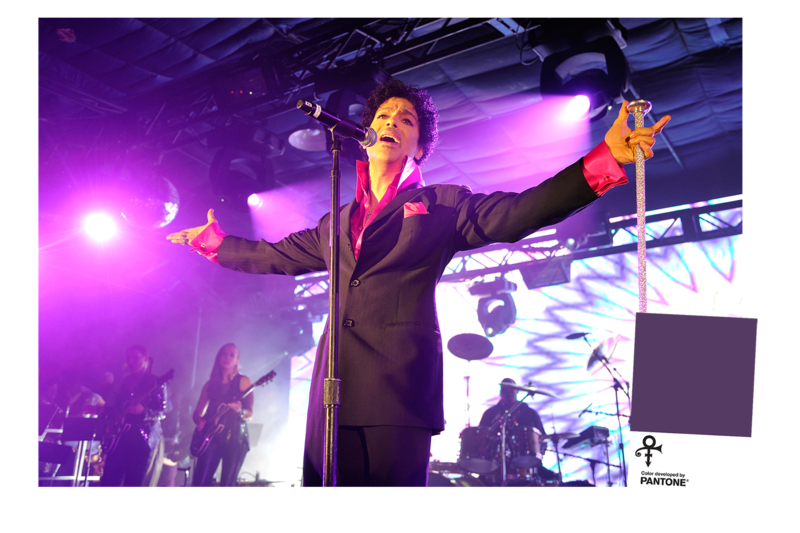 Purple has been irrevocably associated with Prince at least since 1984 when he released the film Purple Rain, winning the Oscar for “Best Original Song Score” for his song of the same name. He spent his remaining decades with a tight grip on the color, wearing purple clothes and strumming on purple guitars. When he passed suddenly of an accidental overdose at the age of 57, the world quite literally lit up with purple tributes. Approximately 90% of painting failures result from insufficient surface preparation. Follow these basic rules when preparing to paint your property. 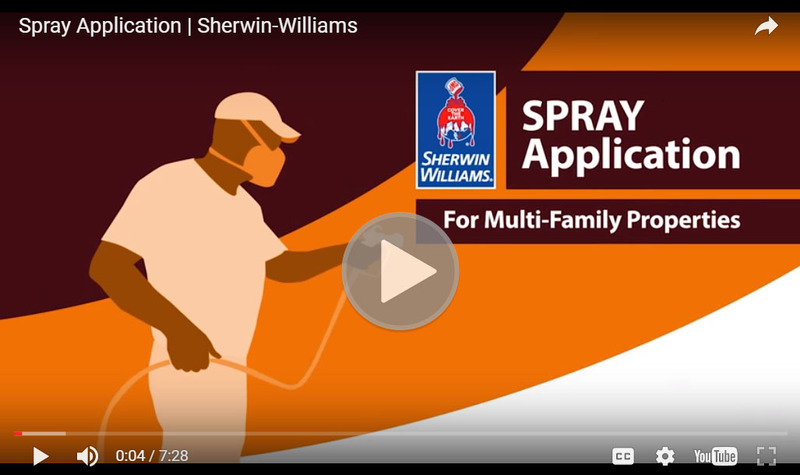 Contact Buyers Access today to learn more about Sherwin-Williams paint. As rents become more competitive and apartment inventory approaches its peak this year, the case for rehabilitating older properties in some markets may be strengthening. Done right, a modest upgrade of a 20- or 30-year-old multifamily community can offer renters a lower price point than new construction. At the same time, the investment is lower and turnaround time to market much quicker. An updated older property may not look as flashy as a brand new mid-rise, but it will be close enough to satisfy the appetite of renters who seek modern conveniences and the latest amenities. While opportunities are far fewer in the urban core than when the latest apartment cycle began about seven years ago, rehabs still make sense in the right markets. Actually, renovating older properties got its legs early on as apartment demand began shifting in high gear. The market was filled with products built in the 70s and 80s that were ripe for upgrading. Most of those have been gobbled up in the big metros, but Portico is seeking rehab projects in tertiary markets and farther afield. The timing for apartment renovations is just as good as any, even as inventory levels are nearing their peak. New inventory – most of it is in the urban core these days – is taking longer to build and costs more as materials continue to rise. New opportunities are out there as the migration to the suburbs by younger renters continues. At a recent National Multifamily Housing Council Research Forum in Plano, Texas, RCLCO Managing Director Adam Ducker said 71 percent of households under age 35 in the top 50 metros live in the suburbs. The figure is slightly higher in Sunbelt metros. Portico, which operates 6,500 units mostly in Texas, has a track record of rehabbing properties of all classes in Dallas, Houston, Austin and San Antonio. As renters flocked to the urban core, some of the more obvious opportunities were updating older downtown properties. However, as the rehab market in the urban core tightened, the company, whose portfolio extends to six other states, was forced to get choosier about where it looks for opportunities. The suburban market holds promise but not all are the same. Age of property and demographics are key drivers that determine whether or not an older property is a good investment, especially in the suburban market. The idea is to spend a few thousand per unit without pricing rents out of the demographic. A 20-year-old product with nine-foot ceilings, washer and dryer connections and need of a little updating is a good bet to compete with newer construction, Williams says. Units may require $5,000-$6,000 each in modest upgrades of appliances, flooring, lighting, paint and some hardware. Because the work only takes the unit off the rent roll for a couple of weeks, the amount of lost rent is minimal. Williams said that type of investment usually will yield $100-$125 more in monthly rent – a favorable return – and elevate the property closer, but just under, the price for a newer development in today’s market. It’s what he calls his “draft-behind” strategy, which has proved successful in several markets. The older the property, however, the more the window closes on opportunity to bring it up to today’s standards. Greater investment of money and time − like installing cabinets and countertops and rerouting plumbing to create washer/dryer connections − can get dicey. The expense and downtime resulting from remodeling can reach a point of no or little return. Even lower ceilings can be a turnoff. Also, the average income of the people living in the community or in surrounding areas must be considered, especially when considering a project that already is well-occupied. Too much enhancement could price existing renters out of the market. However, if the property can draw from prospects in surrounding areas who have the income to support the increased rent, the investment may make sense. Williams says the key to a successful rehab revolves around what the market demands, knowing demographics and testing the product before it is launched. Also, having a good designer in your toolbox doesn’t hurt. When a rehab is being considered at an existing property, Portico puts wood on concrete to see how the market reacts. A unit is renovated and residents are invited for a tour, where the upgrades are featured and the new rent price disclosed. Williams says Portico doesn’t pretend to know all the answers about what trends are hot and cold. The company retains designers to make those calls. And just because a national trend may sound inviting, it doesn’t mean that renters within a certain demographic are on board. In recent years, Portico has focused on updating apartments with newer technology, like plug-ins compatible with USB 2.0 ports. A property in Frisco, Texas, is undergoing installation of smart thermostats, a fairly inexpensive upgrade that more renters are demanding. But not every upgrade has to be très chic. Portico recently asked residents at one Texas property what upgrade they’d most like to have. Buyers Access is currently seeking an energetic and highly motivated Director of Sales for our sales team! This position is for a candidate located in the Georgia/Florida market and would work remotely from this region. Responsibilities for this position include, but are not limited to finding new opportunities for Buyers Access and increasing revenue within an assigned territory. Must have business development or mid-level sales experience and be willing to travel. For more details, please send your resume to Kelly Scott, VP of Sales at kscott@buyersaccess.com. Thank you for your interest in Buyers Access! Student housing is about to enter its busy season. Here is how to weather the storm. Next month, students will begin streaming back onto campus and into their apartments. If student housing operators did not start planning for this onslaught back in spring, they probably are out of luck. “Companies that are starting to think about turning apartments and move-in in late June should prepare for a bumpy road,” says Alex O'Brien, President of Cardinal Group Companies. Experienced apartment operations staff members know that turns will go more smoothly if planning begins in spring or even late winter. It starts with unit walks and inventory orders, according to O’Brien. He negotiates vendor contracts in May and order supplies in June. For EDR, getting its supplier partners lined up early is the most important part of the process, says Lisa Hale-Meindl, a Senior Regional Director at the student housing REIT. “They must have the right insurance and, in some tighter markets, you have to get them secured very early because there may be a good number of student housing properties in the market competing for their business,” Hale-Meindl says. Those vendors need to have their own teams in place as well as backups in case something happens. One key to successful student-apartment turns is getting them taken care of as soon as a bedroom is vacated. Most EDR leases end July 31 and school starts in mid- to late-August, depending on the college or university. EDR’s average renewal rate is approximately 30 percent, so it is turning approximately 70 percent of its beds during those two weeks. This gives Hale-Meindl just two or maybe three weeks to prepare for move-ins, she says. If a community is short staffed for any part of those two weeks, many student housing providers will ask associates from their corporate office to assist. While scrubbing toilets and cleaning floors is hard work, Hale-Meindl says the corporate-level associates at EDR get excited about helping with the hectic schedule. While the turn process can become a grind, Ryder thinks it serves as a significant barrier to entry for those wanting to own or operate off-campus student housing communities. Independent owners can maximize income and value using similar tools to their institutional counterparts'. Here are some suggestions from the National Apartment Association's recent Education Conference. While much of the focus at large multifamily conferences often revolves around new, high-rise, class-A properties, a series of panels at the recent National Apartment Association’s annual education conference concentrated on independent owners and how they can maximize income and value using similar tools to their institutional counterparts’. From small improvement tips, to large-scale unit remodels, to best practices for protecting your assets from insurance claims, the Independent Rental Owners sessions provided key insight for apartment entrepreneurs from experienced industry professionals. Many independently owned units fall into the all-bills-paid category, which differs from large institutional owners who tend to pass off utility responsibility to their renters. Since the landlord is responsible for paying the utilities in an all-bills-paid unit, a quick and easy money saving technique is to manage utility output. Utility benchmarking is a helpful practice, as you can develop a standard for utility usage and then monitor your building’s performance over time. Using a benchmarking system can allow you to target specific utilities and optimize consumption practices. Installing LED light bulbs and updating appliances to meet energy efficient standards are also common practices among independent owners, as well as updating sprinkler systems with smart sensors and timers that track weather patterns and adjust watering accordingly to help cut back on excess water use. Depending on geography, some household amenities are expected as part of the lease, while others are not. If refrigerators or washers and dryers are not expected in your units, consider adding them and increasing the rent. According to Karla Ross of Bob Ross Realty, simply adding a refrigerator to a unit can increase monthly rent by upwards of $50 in certain locations. A high-quality, refurbished refrigerator that costs $550-600 with a three- to five-year lifespan can be paid back in roughly one year. The excess cash flow goes straight into your pocket. Taking the amenity package a step further, Ross recommends analyzing the effects of fully furnishing your units and renting them out as corporate or short-term rentals. Furnished apartments can sometimes go for double the asking rent of an unfurnished apartment. While volatility in occupancy may increase with short-term or corporate rentals, the additional cash flow can often offset or exceed the cost to maintain the unit. Are your amenities still in high demand? Many independent owners maintain portfolios of older stock, and while it’s common to update the interior of buildings and units, often the exterior is overlooked. Does your property have a courtyard or basketball court that are rarely used? Would adding a walkway or changing the color of a fence improve the use of outdoor space? Victoria Cowart of Darby Development Co. recognizes significant value in reconfiguring unused space into more attractive shared areas like dog parks or outdoor entertainment areas with grills and fire pits. As resident desires change, modifying and improving your communal space can improve your curb appeal significantly. Online portals and mobile apps are no longer unique to large owners with significant technology budgets. As Tim Hurley of Highland Commercial Properties explained, it is now simple to create mobile apps using public platforms such as Google Forms. Apps can allow owners to communicate with residents to handle customer service requests and inspections, or contact vendors and service providers to maintain contracts. As technology becomes paramount in the industry, independent owners can stay current with simple and basic mobile app communication. Having the right insurance in today’s market goes beyond carrying the right policy on your property. It is important to ensure that anyone coming onto your property, whether it is a resident, vendor or service provider, maintains their own insurance to limit your liability. Lonnie Derden of Enterprise Risk Control explained that service workers who are injured while working at your property can file a worker’s compensation claim against you if their companies don’t maintain adequate coverage. This can lead to rising premiums for property insurance and can be easily avoided if you verify proof of insurance when signing contracts with your vendors. Renter’s insurance is also a key way to avoid paying insurance claims if something were to happen on your property. Some owners are even providing renter’s insurance to all residents, and including the cost in the rent. Property claims can get very expensive and affect your ability to maintain insurance going forward. If the claim is minimally more expensive than your deductible, it may be wise to pay for the repairs out of pocket, rather than filing a claim, which will impact your insurance rates for the long-run. A quick check of proof of insurance for renters and vendors is an easy way to insure you don’t end up paying avoidable insurance claims. While independent owners often do not have the capital available to institutional owners, they remain competitive by taking advantage of small improvement projects, providing amenities residents use and desire, and ensuring all people entering their properties are adequately covered for liability purposes. Internet- and Wi-Fi–connected products top the list of next-gen products that have the most impact on the resident experience, according to an exclusive MFE survey of multifamily professionals, with 83.5% of respondents rating the products as having a "high impact" on tenant satisfaction. The digital products beat out a host of other items, including lighting, flooring, appliances, and windows and doors. Also highly ranked were security and door locks, utility management, and HVAC systems. 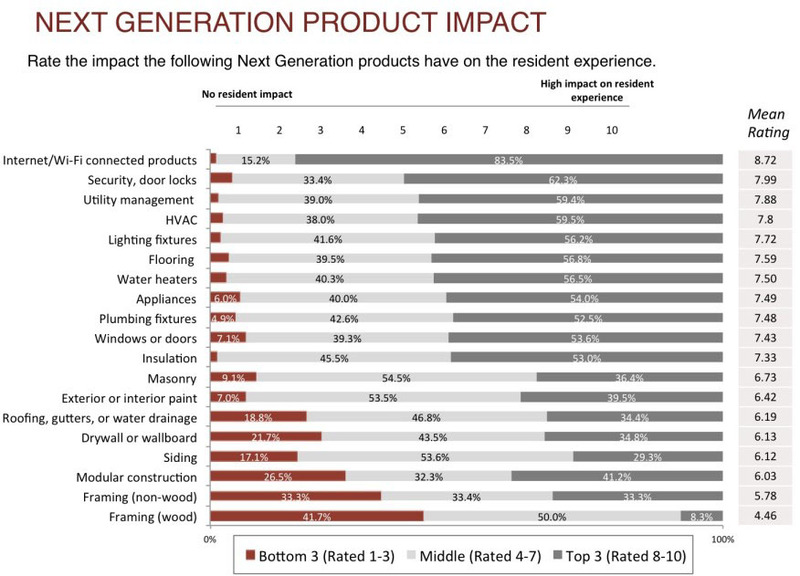 Next-gen building and construction products, in contrast, scored very low among survey participants, who said such products have a relatively low or no impact on the resident experience. Specifically, respondents cited framing, both wood and nonwood, as having the least impact, followed by modular construction and drywall. The study responses were part of a survey conducted by The Farnsworth Group, our data partner on the 2017 MFE Concept Community, examining usage and perceptions regarding next-gen building performance. This year’s survey received online responses from 159 multifamily builders, developers, and architects. Look for more tidbits and stats from the survey in the coming months prior to the annual Multifamily Executive Conference, which will be held Sept. 18–20 at the Bellagio in Las Vegas.